NOTE: This adapter DOES NOT CONVERT electrical output current and voltage. This adapter plug converts the power outlet only. Please don't use it with any appliances with high power consumption. Such as hair dryer, straightener and water heater. CONVENITENT. 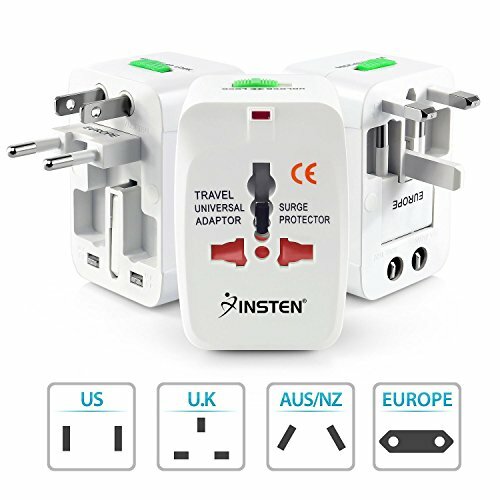 Our travel adapter works in more than 150 countries including EU / AU/ UK / US / CN / JP / HK. COMPACT AND SAFE. Sleek and compact design suitable for traveling. Built-in Safety Protective shutter doors prevent foreign objects from entering, eliminating the chances of electric shocks. POWER INDICATOR. LED indicator shows you the travel adapter in use. PRODUCT TIPS: Please make sure your device supports 100 to 240V and the power consumption within 1000W when you travel to other countries. And please ensure you lock the plug before plugging to the outlet. Note: This charger adapter plug converts the power outlet only, it does NOT convert electrical output current and voltage. Please make sure your device carries a electrical converter when you travel to other countries with different electrical output. Please don't use it with any high power appliances such as hair dryer, straightener and water heater. Converts power outlet when traveling to other countries. LED charging indicator Color: white. Works in worldwide: United States, Canada, Europe, Middle East, South America, Asia, The Caribbean, Great Britain, Ireland, Africa, Hong Kong, Singapore, Australia, Fiji, New Zealand, China, Japan, and more than 150 countries.